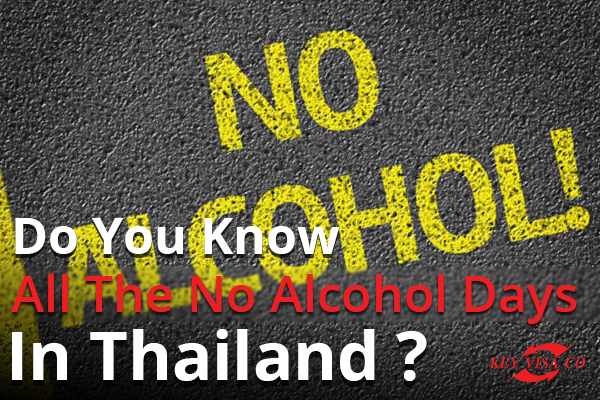 Do You Know All The No Alcohol Days In Thailand? This may come as a surprise to some foreigners but there are certain days when alcohol sales are restricted in Thailand nationwide. This law was passed in 2009 to accommodate Buddhist holidays which take place at certain months in a year. These days have been designated as ‘no alcohol days’ in Thailand and vendors on these days are expected to adhere to the law or face a jail term of up to 6 months, pay a fine of 10,000 Baht or both. H.M King Bhumibol Adulyadej: The people of Thailand celebrate the birthday of H.M King Bhumibol Adulyadej on 5th of December in the city of Bangkok. Hundreds of thousands of people line up in the streets of Bangkok to cheer His Majesty the King of Thailand. This holiday is usually filled with emotions as people pay homage to their king. The onlookers adorn themselves with yellow garments and wave yellow royal flags or Thai national flags. On this day, bars and clubs do not open and they remain closed until the end of celebrations. H.M Queen Siriki: Every August 12th, Thailand holds an annual public holiday in honor of Her Majesty Queen Sirikit’s birthday. The day also serves as Mother’s Day known as Wan Mae. Thai’s consider Her Majesty Queen Sirikit to be the mother of the nation. This is why they celebrate both the birthday and Mother’s Day. On this day, you will notice the queen’s royal blue flag displayed all over establishments. No alcohol is served on this special day. HM King Maha Vajiralongkorn (Rama X): King Maha Vajiralongkorn Bodindradebayavarangkun is the succeeding heir of the Chakri dynasty after his father H.M King Bhumibol Adulyadej who died on October 13th 2016. His son became the tenth king thus he was given the title Rama X. Every June 28th, Thai’s celebrate the birthday of the Rama X in an extra ordinary way. On this day both locals observe a no alcohol day and dedicate the day to their king. HM King Bhumibol Adulyadej (Rama IX) Passing Day: On October 13th Thai’s commemorate the death of HM King Bhumibol Adulyadej (Rama IX). The king died at the age of 88 after a long illness. Being considered the father of the nation, Thai’s celebrate the life of their beloved king in style. On this day you will notice the king’s image adorned in calendars and portraits hanged all over. From this celebration, you can clearly tell that HM King Bhumibol Adulyadej (Rama IX) was a loved man by his people. Let’s look at main Buddhist holidays that have a ‘no alcohol day’ restriction. Makha Bucha: This is a very important holiday in Thailand where more than 1,250 disciples of Lord Buddha gather to hear him preach. This holiday takes place in February or March depending on the lunar cycle. The celebrations start in the morning by Thai Buddhists giving alms to monks. In the evening, they perform a candle ceremony which involves holding incense, flowers and a lighted candle as they walk around the temple. This is a particularly a quiet day as businesses remain closed throughout the day. Visakha Bucha: The Visakha Bucha Day commemorates the life of the Lord Buddha. This day is very significant in Thailand and occurs on the sixth lunar month during a full moon. The full moon marks when Buddha was born and later on died at 45 years to enter Nirvana. Depending on the lunar calendar, the holiday falls in the month of May or June. All bars and clubs are closed on this day. Asahna Bucha: Commemorating the date where Lord Buddha delivered his very first sermon to his disciples, this national holiday takes place in July or August. The locals will flock to the temples to make merit on this special day and that’s why alcohol sales are restricted throughout the nation. Khao Phansa Day: Taking place in July or August, this day marks the start of the Buddhist Lent, which is like a Buddhist retreat period where monks will confine themselves to the temples and the immediate surrounding areas. Besides being a popular season for local Thai men to ordain as monks, a lot of Thai citizens will take it upon themselves to refrain from taking alcohol and eating meat. Awk Phansa Day: Marking the end of the Buddhist Lent, the local Thais will celebrate this occasion by visiting the temple to make merit. It will also usually mark the start of the one-month period of performing Thod Kathin where monks will receive new robes and offerings from various Thod Kathin events organized in the country. Awk Phansa happens in October and the Thai government often designates this day as a no alcohol day.